Central serous retinopathy (CSR), also known as central serous choroidopathy (CSC), is an eye condition that develops due to an accumulation of fluid under the retina. 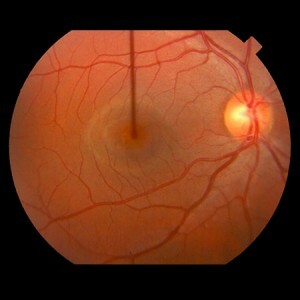 The fluid leaks from the choroid, the blood vessel layer under the retina, into the area beneath the retina. While central serous retinopathy usually affects one eye at a time, both eyes can be affected at the same time. CSR is more common in men than women, and the typical age range is between 30 and 50 years. This can greatly interfere with reading, driving and other normal activities, and may affect a patient's quality of life throughout the duration of the condition. In most cases, treatment for CSR is not required; the condition improves on its own over a period of three to four months without treatment. Patients will need to be monitored for complications and to ensure that leaked fluid has been reabsorbed. For patients with chronic CSR, laser treatments may be required to seal the leakage to prevent permanent vision loss. More than half of patients who develop central serous retinopathy have a recurrence of the condition.